For a nation with a population of a billion plus, India’s position (pardon the pun) on sexual matters is complicated, to say the least. Director Amit Ravindernath Sharma captures the Indian prudishness around the act of baby-making, with gentle humour and sensitivity in his second feature film, Badhaai Ho. The Kaushiks are a Delhi family living in a government housing colony – Jeetu (Gajraj Rao), a greying ticket collector with the railways and part-time poet, married to Priyamvada (Neena Gupta), a homemaker patiently managing a cranky mother-in-law (Surekha Sikri), and two grown up sons, an IT professional and a high school student. A word of appreciation for Sharma’s pitch perfect depiction of middle-class Delhi with all its earthy nuances – from the Rooh Afza served to visitors and bingo parties with a toilet cleaner for a prize, to the nosy neighbours and ageing doctor who can’t resist gossiping about his patients’ ailments. The Kaushiks’ placid existence is rocked by the news of an unexpected pregnancy. Jeetu asks Priyamvada to consider abortion in light of their advanced age and the fiscal burden of a new baby, she refuses, and he, much to his credit, respects her decision to go ahead with the pregnancy – telling her it’s her body and her choice. Rao and Gupta are in fine form– the scenes between the two are tender and unexpectedly touching. He woos her with poetry and mangoes, stealing glances in crowded places, his eyes alight with love and pride (his new reputation for virility brings a subtle change in his body language too). Neena Gupta’s dignified beauty and restrained performance lights up the screen. 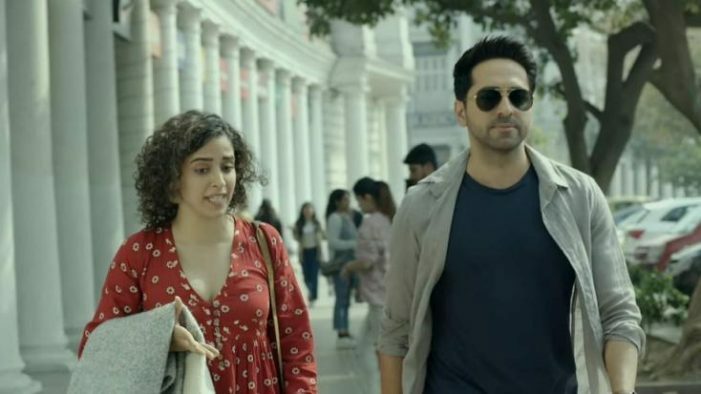 There is real warmth and chemistry here, somewhat missing in the relationship between millennials Nakul (Ayushmann Khurrana) and his upper-class girlfriend Renee (Sanya Malhotra). The reactions to the pregnancy news varies from the anger and embarrassment of their sons to contemptuous judgement from Renee’s snooty, seemingly progressive mother (Sheeba Chaddha). Renee is far more accepting, telling her boyfriend he is being juvenile in his resentment, “a typical Indian man who puts his mom on a pedestal and forgets she is a wife with wants and desires”. Surekha Sikri’s rant to the red-faced couple is another high point of the film, matched in dramatic intensity with her monologue in the second half. The well-paced, funny and incisive first half gives way to a decidedly uneven second half that piles on the emotion through the all-too familiar trope of the big fat Indian wedding, but runs low on the humour. The trajectory veers to Renee and Nakul’s relationship; I wish we had more of Priyam and Jeetu instead. Badhaai Ho wins you over with a refreshingly different story and its sharp and funny take on Indian attitudes to intimacy. Its gives the messege to the society that their is no bounded period of time for expressing his \her love to theri spouse. Love is forever in between husband wife even though they became parents or in the age of 40s or 50s . Movie explains that after a certain time period in indian middle class society people dont allowed themseleves to enjoy their love life or having fun with their spouse. because of lots of reasons like family resposibilities, lack of time, space, what will other thinks and all. its all a myth. Respect each other love each other forever. Badhaai Ho is a family entertainer which will make you laugh, cry and most imp entertain you in all manner. I personally loved its both songsi.e. Morni ban ke ammazing and sajan bade senti track. Story, acting, screenplay, direction are excellent.